Voting in parts of Nigeria have been extended until Sunday, March 29, after delays and a number of attacks. Technical problems with new biometric cards slowed down voter registration, even affecting President Goodluck Jonathan. More than 20 people have reportedly been killed in various attacks by unknown gunmen. Incumbent President Goodluck Jonathan is facing a strong challenge from Muhammadu Buhari. The election is said to be the most closely fought since independence. It was postponed from mid-February to allow the army time to recapture territory from the Islamist militants of Boko Haram. The two main candidates had pledged to prevent violence during and in the aftermath of the elections. Several hours after voting started, reports came in of violent incidents at polling stations in which at least 24 were reported to have been killed. 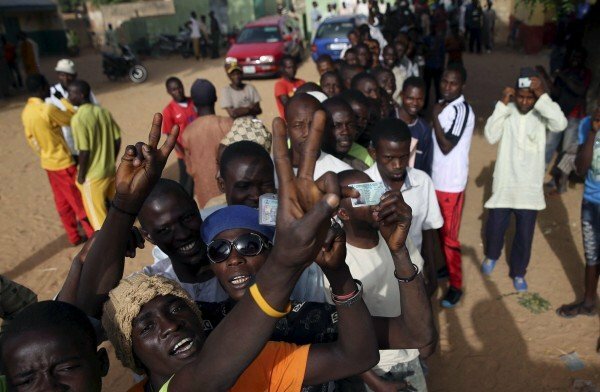 Thousands of Nigerians turned out to vote, despite threats from Boko Haram to disrupt the poll. According to the Transitional Monitoring Group (TMG), the largest body observing the elections, voting had started in 75% of polling stations, while 92% had the materials they need to start the process. Voters need to register using biometric cards with their fingerprints before they can cast their vote. However, there have been problems with card readers at many polling stations. The Independent National Electoral Commission (INEC) said the accreditation process had “gone on well in several places”, but was “slow” or had “not commenced at all” in others. Goodluck Jonathan tried for some 50 minutes to register in his home village of Otuoke, before coming back a second time. When the electronic registration failed again, he had to be accredited manually before casting his ballot paper. Gen. Muhammadu Buhari did not have any problems registering in his hometown, Daura. Attacks were reported in north-eastern Gombe state, including incidents where gunmen opened fire on voters at polling stations. It is unclear whether the attacks were the work of Boko Haram militants or political thugs.